We will be getting more into the Valentine's spirit in the upcoming weeks, but until then I wanted to share an easy to put together preschool math tray involving play dough and heart shaped manipulatives I picked up from the Dollar Store. The hearts turn this activity into a simple math activity perfect for Valentine's Day! To set up this Play Dough Search and Count Math Activity, place a number in each 'section' of your tray. Next add a certain amount of manipulatives into the play dough and work it into a ball. Invite your child over to dig and search through the play dough to find the heart shaped manipulatives. Once they have all been found in the play dough ball, count the manipulatives, and put them in the section of the tray with the same number. 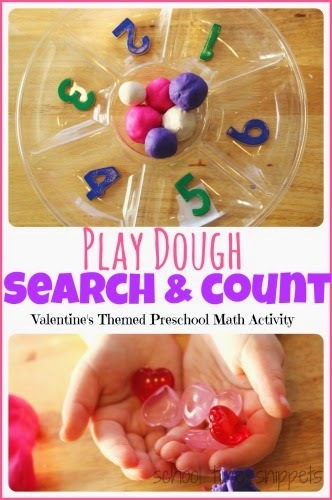 Our Play Dough Search and Count Math Activity and be used with any type of small manipulative, but is a great way to reinforce counting, number recognition, and fine motor skills! Thanks for joining us for Fine Motor Friday! Need more fine motor ideas? Check out our latest book!